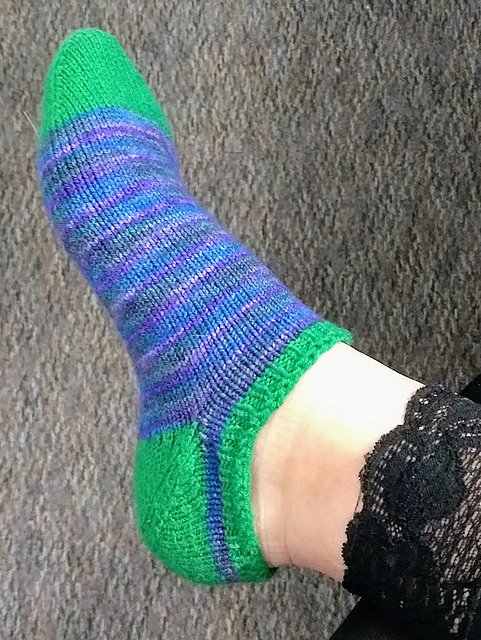 I made a sweet pair of ankle socks last year, trying out an afterthought heel with a short cuff. They came out fine, but they tend to slide down when I wear them with ankle boots. So, rather than having them sit around in my sock drawer and not get worn, I decided to pull out the cuffs and reknit them so that they’re taller and more snug around my ankles. In my experience, the reactions from most people (from non-knitters all the way up to experienced fiber folks) who hear that I’m ripping back a project fall somewhere between pity and horror. There’s been a lot of discussion online about project planning, experimentation, frogging, what folks do with WIPs that won’t ever be finished, and the worth of materials (here, here, and here in particular). All of these discussions have informed my attitude about ripping back projects, but my viewpoint hasn’t changed much over the years. First of all, it’s just knitting. I’ll keep doing it whether I’m working on one particular project for a long time or starting something new, so I’d rather end up with one finished garment that I (or someone) will wear and love, with materials that are used and serve their purpose, than a couple finished – or maybe unfinished – projects that are unsatisfactory for some reason. I’ll gladly tear out my work, however “correct” or “incorrect” it might have been, if redoing it will improve the overall usefulness of the garment. With that said, I’ll gladly ignore a “mistake” if it has no effect whatsoever on the finished product’s wearability and durability. One extra row on the foot of one sock? I highly doubt the wearer will ever know, so if it’s more work than it’s worth to fix it, you can bet that one sock is going to stay sliiiiightly longer than the other. In this case, the shortness of the cuffs was detracting from the wearability of the socks, and it was also a relatively easy fix. 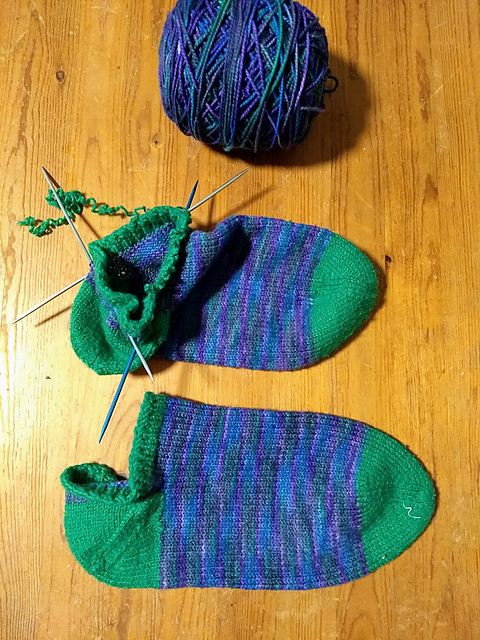 I make all my socks toe-up, so all I had to do was unpick the bound off edge and frog the last few green rows. I used size 0 double pointed needles to pick up the last row of the main color yarn, then frogged the cuff’s contrast yarn down to the needles. I joined the main color yarn to itself, then knit up the cuff with an inch or so more ribbing than it had before. I haven’t decided yet whether to use the green as a contrast color again, but I’m leaning towards not. The purple is lovely and I tend to think that changing color in a section of ribbing doesn’t look super nice.